It started pretty well for a Wednesday, with breakfast at Joe’s Kitchen with my friend Nick who bears a striking resemblance to Richard Hammond, but more of that later. After a relaxed breakfast of pancakes and mixed berry smoothie we set off for the Top Gear studio which is located at the Dunsfold Aerodrome in Surrey. We made a quick pit stop at the service station on the A3 and meet up with Mike and Jane for lunch at the Little Chef. Unfortunately, this Little Chef had not received the Heston Blumenthal makeover, and looked like it had been stuck in a time warp for the last 20 years. 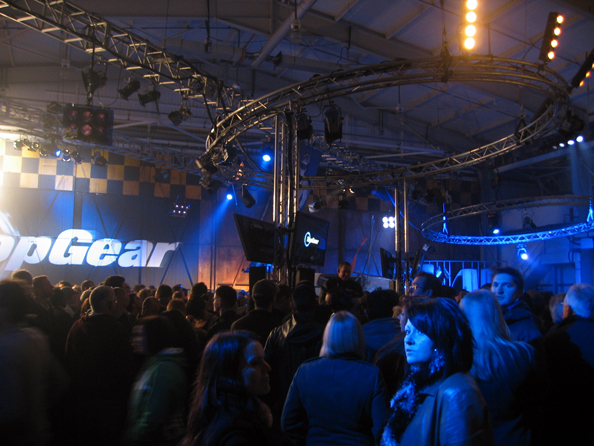 After several unsuccessful attempts to get tickets from the Applause Store for previous series of Top Gear, it was a very surreal feeling as we entered the hanger where Top Gear is filmed. 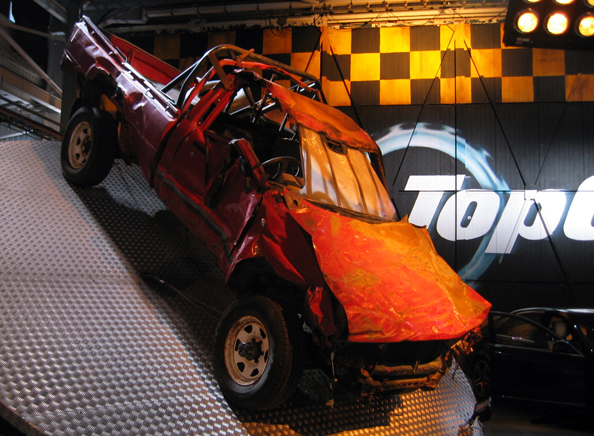 All around the hanger were iconic pieces from the TV show including the indestructible Toyota Hilux, the Fiat Coupe police car and the Cool Wall. The lighting made it difficult to take good photographs, but we managed to get a group photo in from of the Cool Wall as shown below. 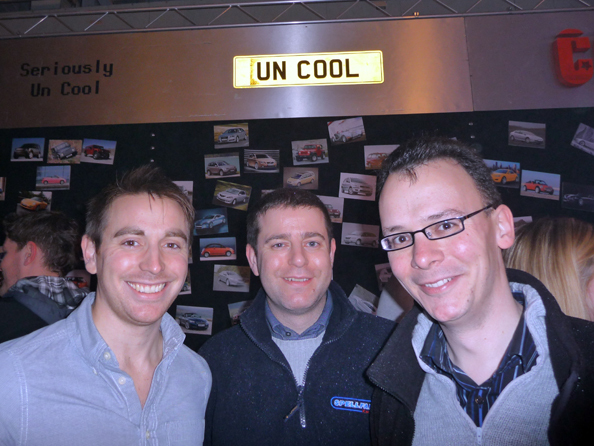 We might be “Un Cool”, but at least we didn’t turn out to be “Seriously Un Cool”. I had received tickets for Series 16 Episode 3, and the main feature this week was a group test of the Rolls-Royce Ghost, Mercedes S65 AMG and Bentley Mulsanne in Albania. This was interspersed with a review of Ford Focus RS500, Cosworth Impreza CS400 and Volvo C30. The filming ran very smoothly with Jeremy and the team filming most pieces to camera in a single take. 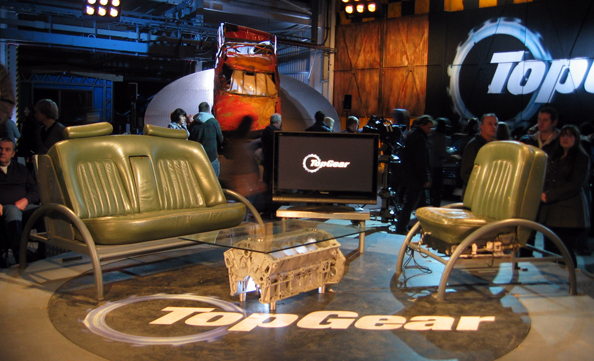 Jeremy Clarkson was very funny and engaged with the audience between filming which created a good atmosphere in the studio which certainly comes across on television. In comparison Richard Hammond looked moody and fed up between takes. However, as soon as the camera was turned on he came alive, but at no point did he make any effort to interact with the audience. James May only made a single comment on one of the news stories and filmed the link to the second half of the Albania feature, otherwise he was notable only by his absence. From attending the filming it became very apparent just how much Jeremy really carries the show. The “Star in the Reasonably Priced Car” this week was Jonathan Ross. The interview lasted for about 40 minutes, but in reality this will be cut down to around 10 minutes when the show is broadcast, at least in part to the amount of swearing and references to Mexicans. 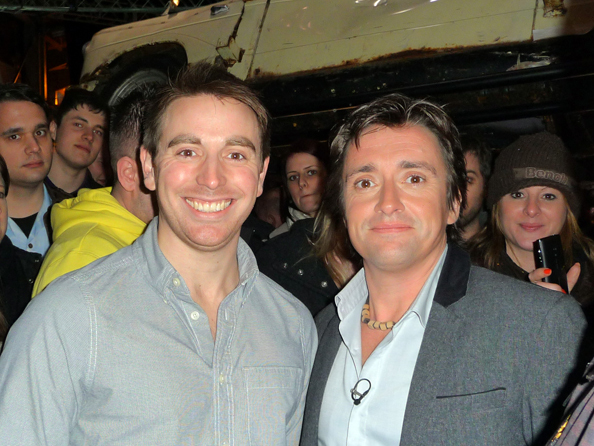 Many people have remarked on my friend’s likeness to Richard Hammond, and during the afternoon break for tea and biscuits, Nick took the opportunity to try and disprove these rumours, but I think he may have confirmed that they do actually look alike. The episode was first shown on the evening of Sunday 6th February 2011, but unlike many of the 200 people that attended the filming, we didn’t feel the need to push to the front to try and get our 5 minutes of fame on television. However, you might be able to catch a glimpse of us behind the white Ford Sierra RS Cosworth at the start of the hot hatch feature or at the end of the show when Jeremy closes the show on a bombshell.